可算名詞 【動物, 動物学】 オコジョ，エゾイタチ，(俗に)白テン 《イタチ科の動物; 冬毛は黒い尾の先を除いて白くなる; 毛色が赤褐色の夏期には stoat と呼ばれる》. From Middle English ermine, ermin, ermyn, from Old French ermin, ermine, hermine. 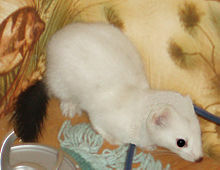 There are two main theories for the origin of Old French ermine. Germanic origin is suggested via Old Dutch *harmino (“stoat skin”), from *harmo (“stoat, weasel”) (compare Dutch dialectal herm), from Proto-Germanic *harmǭ, *harmô (compare 古期英語 hearma, Old High German harmo (harmin (adjective), obsolete German Harm), from Proto-Indo-European *ḱormō (compare Romansch carmun, obsolete Lithuanian šarmuõ). Romance sources identify the animal with the corresponding word for Armenian, possibly from Medieval Latin mūs Armenius (“Armenian mouse”) or a posterior compound. A weasel, Mustela erminea, found in northern latitudes; its dark brown fur turns white in winter (apart from the black tip of the tail). The white fur of this animal, traditionally seen as a symbol of purity and used for judges' robes. (by extension, figuratively) The office of a judge. (heraldry) A white field with black spots.